Stroke can also be known as a cardiovascular accident (CVA). In Ireland, approximately ten thousand people per year suffer a stroke of which 2000 of those result in death. These astronomical number means that the health system along with family members are under serious strain. Physiotherapy is a vital part of stroke rehabilitation to help patients which regain as much independence as possible. 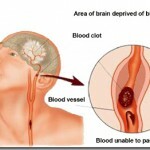 2) Excessive bleeding in a certain part of the brain. The initial signs and symptoms of a stroke are 1) paralysis of one side of the body 2) the mouth on that side may drop and speech becomes slurred. Its very important to act fast if you see these early signs because early medical and surgical treatment will help prevent more damage being done in the brain. Strokes can range from being mild to severe. Physiotherapy is very important part of the patients rehabilitation. Our physiotherapists work in a multidisciplinary approach ensuring that communication amongst the speech and language therapist, occupational therapist, GP and consultant occurs to ensure the best rehabilitation for the patient. We offer home care for patients who cannot attend the clinic for regular therapy. We can set up a therapy room for you at your home so that it is more convenient for you to stay at home until more mobile to attend other rehabilitation services or come to the clinic for your treatment. We work closely with our patients and family members to get the most out of treatment. Its important that this approach is taken and that we maintain and upbeat very focused and driven approach to achieving optimum result for you. When catastrophic event such as stroke affects you and your family you can feel very low. You can feel lost and unsure of your future. Our physiotherapists are here to support you and help you achieve results you may have thought were not possible. If you or a loved one has suffered a please do call us. We are happy to chat over the phone and answer any questions you may have about how physiotherapy can help with stroke recovery.